What!? You shift around to glance at your 6-year-old. You give him a heavy stare and then ask again, “What did you say?” He repeats the word again with the casualness of a morning greeting. Your 6-year-old just blurted a word of profanity! 1.Try to determine if older family members, friends, or TV viewing are providing your child with the improper words he is using. Young children are excellent mimickers. If they are hearing inappropriate words from those they regularly interact with, you might have a continuous battle trying to get them to stop using the words themselves. If you conclude they are getting the words from others around them, attempt to limit your child’s contact with these sources and mention your concerns to the individuals, as well. Mention this hadith to your child often, not only during times of flagrantly ill speech, but also when he calls his friends and siblings hurtful names. 3. Provide your child with alternative words to use when he uses inappropriate words of a lower grade than profanity. Tell him instead of using “, say “uninformed”. Instead of saying I hate Jamal, say Jamal “irritates” me. Children take pleasure in learning new words and phrases. 4. When you hear your child using proper words, compliment his behavior. One way of showing your child you are pleased with his pleasant words is by using incentive charts. 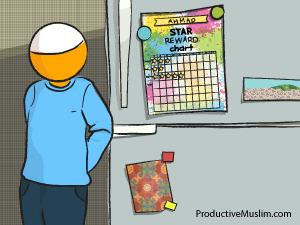 Simply place a star on your child’s chart whenever he uses good words instead of negative words. When he reaches a certain number of stars such as ten, give him a special treat. Incentive charts work wonders! Acknowledging your child’s proper speech will go a long way toward encouraging him to use suitable words in the future, In sha Allah. 5. If the words aren’t exceedingly objectionable, try ignoring your child when he uses distasteful words. Sometimes kids go through phases with offensive words. They use them for a while then switch to others. Although the words ‘stupid’, ‘crazy’, and ‘dumb’ aren’t nice words, they aren’t profanity. It can become a chore following every single improper word your child uses. 6. Set a good example for your child. When you speak to or about others, use pleasant words. Let your children hear good words flowing from your mouth on a regular basis. In the long run, this might be the most productive way of taming your child’s foul mouth. Share any tips you might have in the Comments section below.